Exodus - 1. The flight of the Hebrew people from slavery in Egypt. 2. Book of the Pentateuch that tells of the flight of the Hebrew People. 3. Aliya Bet (illegal immigration) ship. 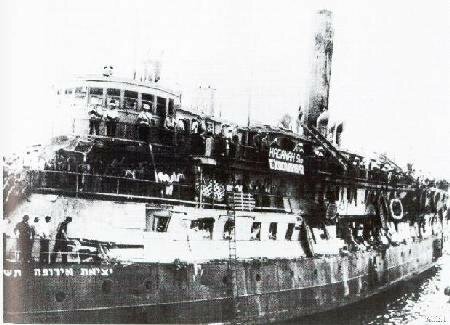 In June of 1947, the British rammed the Jewish illegal immigrant ship Exodus (formerly "President Warfield") on the high seas after it departed from France, June 11. They towed it to Haifa where it was the subject of extensive publicity, generating public sympathy for the Zionist cause. The passengers were eventually disembarked in Hamburg. The incident set world opinion, and particularly US opinion against the British, and caused the British to intern illegal immigrants thereafter in Cyprus, rather than attempting to return them to Europe. "When the four members of UNSCOP came back to Jerusalem, Eban recalled, 'they were pale with shock. I could see that they were pre-occupied with one point alone: if this was the only way that the British Mandate could continue, it would be better not to continue it at all.'"